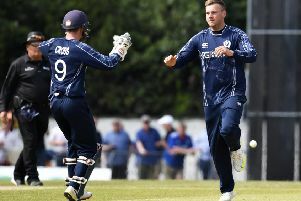 Heriot’s spinner Ryan Brown starred as Scotland’s under-19s won Pepsi ICC Europe Division One by defeating Ireland – and qualified for the World Cup in Bangladesh next year. At Grainville in Jersey, Scotland had to defeat the Irish if they were to have any chance of winning the four-team event which also involved the hosts and the Netherlands. Batting first, Scotland made 244 all out, captain Neil Flack leading the way with 71 from 96 balls. In Ireland’s reply, Brown took 3-37 and then Glenrothes’ Ben Wilkinson took 5-22. Eventually, Ireland were all out for 161 in the 45th over.